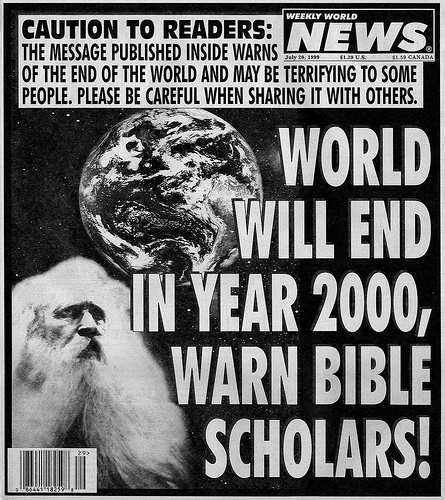 Does anyone still remember the Y2K bug that threatened to end the world as we knew it on New Year’s Day 2000? The problem was caused by the way early computer programs were written, allowing only two figures to indicate the year section of the date. The first two numbers of the year were assumed to be ‘19’ so that 4/5/00 stood for April 5, 1900. When the year 2000 came around the date would be written 4/5/00 again, this time standing for April 5, 2000. This could be very confusing when comparing dates of events that happened over long stretches of time. A baby born in 2000 could have a her date of birth registered as 4/5/00 and thus appear to be 100 years old on the day she was born. President Clinton appointed a Y2K czar to oversee activities designed to head off the problems. People with a tendency to worry, worried even more. A few people headed off on extravagant vacations on the assumption they would not need money after the world ended. When January 1, 2000, actually rolled around however, nothing much happened. Corporations and public agencies had hired computer experts to reprogram computers; no major system failures occurred and the new century rolled on. The one tiny reminder of the great even that remains is that now when we enter dates into most computer-generated forms, we use four figures for the year—2014 or 2025—rather than the two figures we used back in the twentieth century. The passing of what appeared to be major catastrophes is a good thing to look back on as another new year rolls around. For many of us the year ahead holds more fears than hopes—wars continue to bedevil us, climate change rolls relentlessly on, people have not yet shown the generosity necessary to overcome poverty in the world, but perhaps there is still hope for the new year and the years to come. At the beginning of the twentieth century, when the year 1900 was on the horizon, Thomas Hardy wrote a poem of limited hope. It doesn’t suggest a divine intervention to bring happiness or wealth, but just acknowledges that hope exists and perhaps we can find it when we look at the world around us. Hardy found it in the song of a bird.